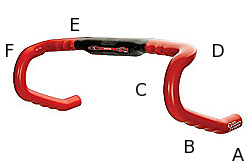 I found it odd that while talking to another rider that theu weren't aware of the various hand positions when using a drop bar handle bar setup. So I told them that I'd add a page with some of my different ways of positioning my hands on my drop bar setup. While searching for the best picture of handle bars and hoods I came across the Harris Cyclery web page on Handlebars For Touring. (And yes, I know who Sheldon Brown was, may he rest in peace, he sold me on Brooks saddles). Tom Deakins shows you 4 possible locations for your hands. I have 7 - 8 possible positions. One thing to note on Tom's page. He seems to have a pretty good grip on the handle bars. I'd recommend loosening your grip a bit. If you are spending so much energy keeping a tight grip on the bars then you'll tire quicker. My fingers are almost just hanging there when I'm riding. Somewhere between a death grip and just hanging there will be the correct balance for you. Generally the prefered position is to have your hands close to the brakes so you can stop quickly. It's one of the reasons STI were invented. At the end of the drops, not one of my favorites but one that allows me to bend and stretch my back a bit. On the angle in the drops. I find this to be useful when battle a head wind. Some handle bars, like my new ones don't have this section. on the outside curve of the upper bar. I simply wrap my thumb over the top and wrap my hands around the outside. On the top of the bar towards the stem. This gives you a very upright sitting position.